This article is taken from the Nov. 5 issue of ESPN The Magazine. If you aren't picking the Spurs to take the 2008 NBA title, your reasoning is simple: They won last year. Bill Simmons talks about the past, present and future of the NBA with TNT analyst (and NBA Hall of Famer) Charles Barkley. You don't care that the Spurs have the best player, best coach and most experience. You don't care that they play so beautifully together, that they didn't lose anyone who matters from last season's team, that they went basically unchallenged last spring except for a brief moment in their series with the Suns. You don't care that no other potential contenders improved except Houston, Boston and maybe Chicago. The Spurs won last season, which means they can't win this season. That's the logic. Now, there are three types of people who make preseason picks. The first type takes someone other than the best team just for shock value. If I picked Denver over Detroit in the Finals, you'd say, "Wow, the Nuggets? Really?" even as you secretly thought I was a fool. The second wants to avoid picking the favorite, so he weighs all other options and eventually talks himself into choosing someone else. I weaned myself off this habit because it's an easy way to lose money (you know, if gambling were legal). Why talk yourself out of a logical pick just so you can make a less logical one? It's the same mentality that causes women to opt for dangerous guys over safer ones with the potential to be better long-term boyfriends. I know what I have behind Door No. 1; I don't know what I have behind Door No. 2 ... Screw it, let's roll the dice. Door No. 2! 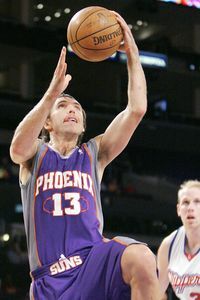 Steve Nash and the Suns are a splashier, more popular pick this preseason. That's the theory informing every Phoenix backer right now. 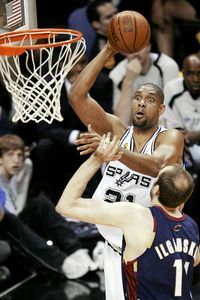 The Suns lost fairly convincingly to San Antonio in the playoffs, then dealt Kurt Thomas, their only big man who could defend Tim Duncan (and by defend I mean hold him under 35 points). Who's guarding Duncan on the 2008 Suns? Stoudemire? Diaw? Puh-leeze. If you're picking the Suns to beat the Spurs, you'd better hope Duncan gets injured or contracts a rare tropical disease by April. So the Spurs are the only logical pick ... unless you're banking on history, the third -- and best -- approach to choosing an NBA champ. For years now, it has been nearly impossible to repeat without a player like MJ or Magic leading the way. After Bill Russell's Celtics captured 11 of 13 titles, another 19 years passed before the Lakers repeated with their luckiest title ever. (Bring up the 1988 Finals to a Pistons fan who has a few drinks in him and see what happens.) Even in a diluted league, the Spurs have won only in alternate years -- 2003, 2005 and 2007, although they came damned close in 2004, the year of Derek Fisher's miracle shot, and 2006, the year of Dirk's three-point play. You need to stay healthy and hungry, need a little luck, need your dominant player to be just that, need to avoid the pitfalls that come with success. In his book "Showtime," Pat Riley unveiled "the disease of more" and argued that "success is often the first step toward disaster." According to Riley, after the 1980 Lakers won, everyone shifted into a more selfish mode. They had sublimated their respective games to win as a group; now they wanted to reap the rewards as individuals, even if those rewards meant having to spend way too much time at Jack Nicholson's house. Everyone wanted more money, playing time and recognition. Eventually they lost perspective and stopped doing the little things that make teams win and keep winning, eventually imploding in the first round of the postseason. So much for defending the title. Great concept, greater name: the disease of more. It festers in every sport -- in the 2005 Red Sox, the 2003 Lakers, the 2006 Steelers. I remember watching a montage of Johnny Damon clips with my father before Opening Day 2005 -- Johnny on "Regis and Kelly," Johnny on "Queer Eye for the Straight Guy" -- and at some point, Dad turned to me and said, "There's no way we're winning this year." Once you get caught up in everything that comes with winning, you stop winning. Rarely does a team avoid pettiness, acrimony and self-flagellation to stay focused enough to repeat. You need a great coach and a greater star to keep everyone in line, and you need character guys up and down the roster. The Spurs have all those elements in place, so the disease of more shouldn't sidetrack them. (If Eva turns Tony Parker into a celebrity diva, all bets are off.) Russell, though, discussed an even bigger obstacle in his autobiography, "Second Wind": "It's much harder to keep a championship than to win one ... You can't rely on the same drive that makes people climb mountains for the first time; winning isn't new anymore." If Tim Ducan stays healthy, the Spurs are a good bet. That makes sense whether you're talking about players, coaches or fans. When the Sox were trying to win in 2003 and 2004, it felt like life-or-death to me. Three years later, I found myself just as caught up in October, but a small piece was missing -- every game carried urgency and tension, only that life-or-death component had vanished. As much as I wanted the Sox to keep winning, my life wasn't going to fall apart if they lost, because they'd already won in 2004. Oddly, it was somewhat liberating to watch these 2007 playoffs. I found myself thinking about how great it would be if they kept winning, not how painful it would be if they lost. Which makes me wonder how TD and the Spurs get psyched for another 100-game grind. How do they keep tapping into that hunger when it's already been sated? The Bulls never let up because MJ wouldn't let them. Boston never let up because Russell wouldn't let them. What's driving the Spurs? Duncan and Popovich love winning, but they aren't puking before big games like Russell did, and they certainly aren't suffering from Jordan's severe competitive disorder (we learned this for sure in 2004 and 2006). Meanwhile, Nash is Robert De Niro at the end of "Midnight Run." Helicopters are flying over him, he's about to lose the Duke, his demeanor is hardening as the clock ticks down on his mission -- or in Nash's case, his prime -- and he looks at those choppers and mutters, "I've come too far; I've come too [bleeping] far ... "
So here's a scenario that isn't far-fetched: A faster, hungrier Suns team goes small in the Western finals, conceding Duncan's 35/15 every night to force a breakneck pace that doesn't quite suit the more talented and slightly less hungry Spurs. Nash raises them to another level because he wants it more than anyone else. Conceivable, right? Unfortunately for Suns fans, it's not nearly as conceivable as the alternative: Duncan rules, and the better all-around team prevails. It's the boring pick, the logical pick, but as much as we hate to admit it, sometimes sports is boring and logical. That's why I'm going with the Spurs over the Bulls in five, and that's why, eight months from now, you won't even remember that I was right.